When folks think of Chicago, some foods that come to mind are hot dogs, pizza, Italian beef sandwiches, even cheesecake. Another one to add to the list is Chicken Vesuvio. I'm not particularly sure of the Chicago origins of this dish but what I can say is that it's a flavorful chicken dish to enjoy. This is a one pot wonder in my book because the entire recipe is made in one pot, cooked in the Instant Pot and oven. Imagine crispy chicken with potatoes cooked with oregano, thyme, garlic and white wine. Add in some artichokes and finish it off with a buttery sauce that captures every bit of flavor cooked in the Instant Pot. If you haven't tried this dish, now's the time to take advantage of this recipe! Press MANUAL on the IP and add olive oil. Season chicken with salt and pepper. When oil is hot, add the chicken pieces, skin side down, and cook without disturbing for about 8 minutes or until golden brown. Flip pieces over and cook another 5 minutes. You may need to do this in batches. Remove the chicken to a plate and set aside. In the now empty IP, add the garlic and onions to the same pot and cook until softened. Add the potatoes and cook until they are golden brown, stirring occasionally, about 10 minutes. Add the wine and stir to scrape up any brown bits on the bottom of the pot. Add the broth, oregano, and thyme. Return the chicken to the pot, nestling them on top of the potatoes. When the IP beeps after pressure cooking for 10 minutes, allow your IP to naturally release pressure for 5 minutes. While naturally releasing pressure (also known as NPR or NR), the display will reflect numbers counting up from 1. The numbers indicate how many minutes the IP has stopped cooking since it beeped (or how many minutes it has been naturally releasing pressure). No need to touch your IP while it naturally releases pressure. The pin at the top of your IP will drop when all pressure has been released and it's safe to open. Remove the chicken from the IP and transfer the chicken to a platter. 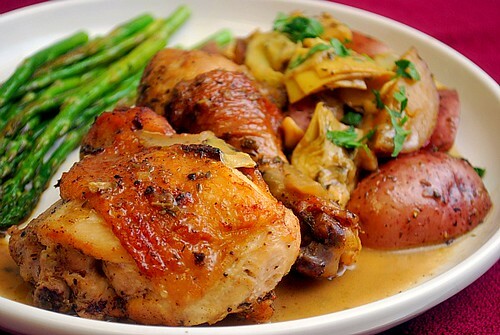 Arrange the potatoes around chicken. Press SAUTE on the IP and add the artichoke hearts to the sauce in the pot. Cook on SAUTE setting until the artichokes are tender, stirring often, about 4 minutes. Press WARM on the IP and stir in the butter. Transfer the artichokes to the platter with the chicken and potatoes, pour the sauce over the dish and serve. This recipe looks awesome as do many others that you have shared. I just can't seem to find how to print them.